Growing on a Zinia (one species of flamboyant garden flowers from overseas) and a Galinsoga species (perhaps Galant Soldier ?). 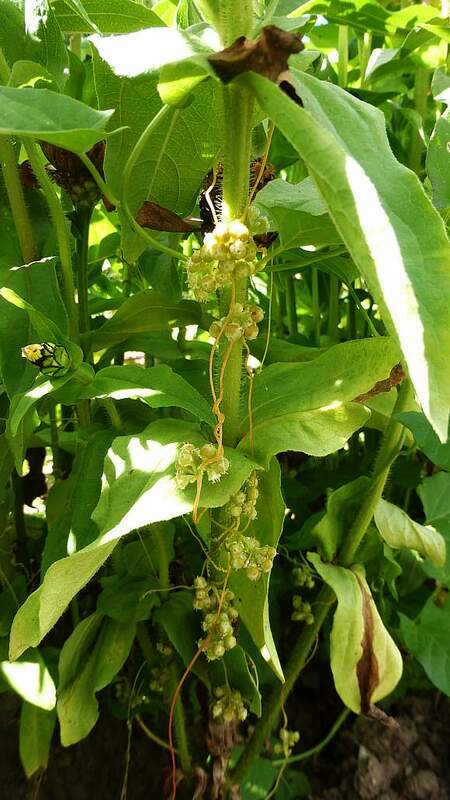 One or two small white flowers mingle with the developing fruits of Yellow Dodder strung together on a sinuous yellowish stem. 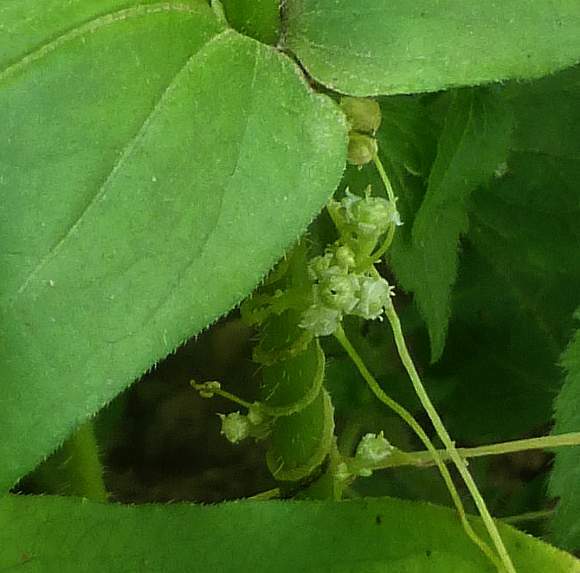 Yellow Dodder is very partial to parasitizing Carrot and to a lesser extent other arable vegetables. 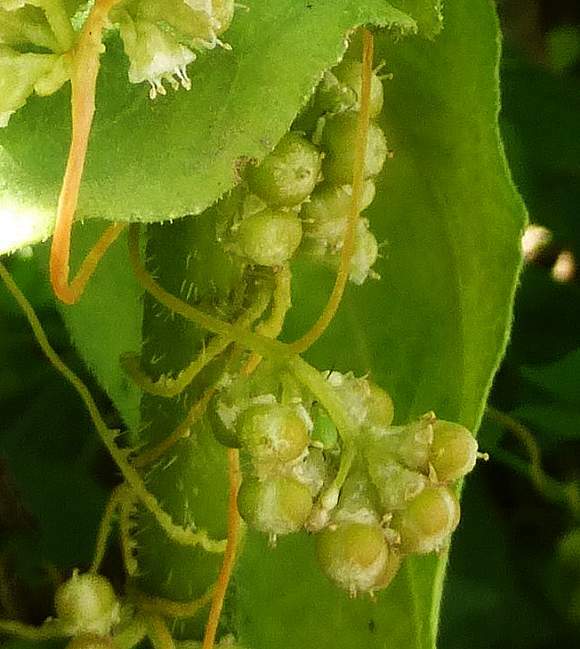 The nearly bell-shaped white flowers mixed in with the still developing pale-green fruits. Right at the top, centre are several nodes on the yellowish stem which are feeding from the main stem of the plant it is embracing. On this specimen are flowers with only 4 stamens rather than the normal 5 stamens, but they are well proud of the petals. The developing pale green spherical fruits, some with pale white withering petals still attached. The pale-green spherical fruit. On the pale yellow-green stems can be seen small conical projections directed towards the main stem upon which the Dodder is parasitic. Some have come loose, but these are the means by which Dodder parasitizes the nutrients from the hosts, absorbing it through the attached cones. To differentiate between the 3 species of Dodder the length of the styles in comparison to the height of the ovary must be carefully observed, as well as the presence or absence of a small round stigma. This means having opened flowers to tell. They have little or no chlorophyll with which to photosynthesize, and gain almost all their nutrition (if not all) from the stems of other plants. They are thus holoparasitic , depending solely on the host for nutrients. Yellow Dodder has but a few days as a seedling growing from its own fruit in which to find a suitable host to parsitize before it will die. They do not search for a host blindly: they respond to the infra-red light reflected off the green parts of other plants which can photosynthesize and grow preferentially in that direction until they can attach themselves to a suitable host. This is a Photonastic response, initiated by light (in this case light of a specific wavelength range). They are confused by direct sunlight and search randomly, but are usually able to find a suitable host. They attach themselves to other plants by means of small conical projections called haustoria which they embed into the tissues of the host plants. This makes them hard to manually extricate. 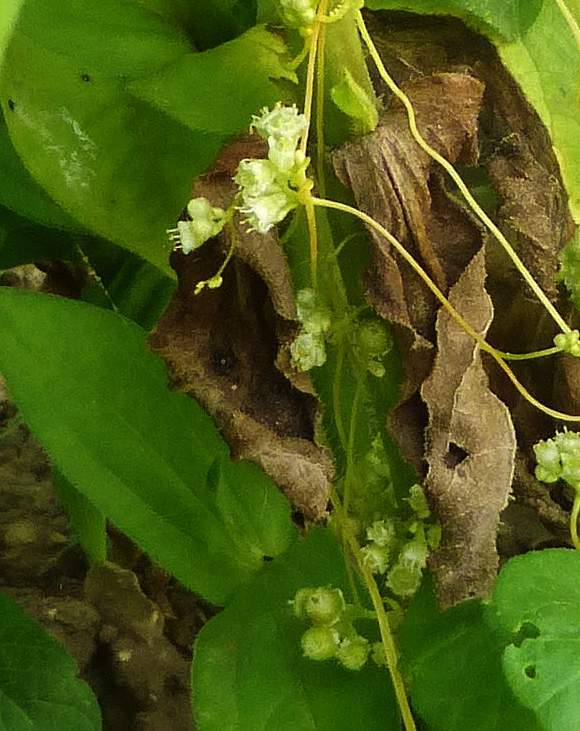 They do not kill the host plant, but they do weaken it such that it may not bear flowers or fruit or seed - perhaps in order to save the host from overcrowding and the shielding of the Sun from its host (perhaps it wants its host to get as much sunlight as possible, so that the Dodder can parasitically feed at will without actually killing the host). The long parasitic stem of Yellow Dodder is not necessarily all pale-yellow; it can be pale-green as well as pale orange (but perhaps is never as red as can either Dodder (Cuscuta epithymum) or Greater Dodder (Cuscuta europaea) be). 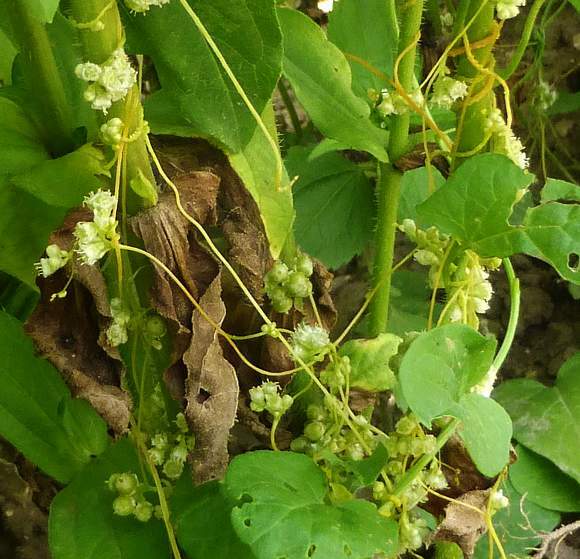 Of these two other Dodders found in the UK, Yellow Dodder is not fairly rare. It likes to parasitize Carrot mostly, but will parasitize other vegetables grown in fields, such as tomatoes, and Alfalfa (aka Lucerne), or even as depicted here, the garden plants belonging to the Zinia genus.